THE RFU are pioneers in the way they run their disciplinary system, and in-keeping with their policy of openness they have released the full transcript of the Mark Cueto hearing this week, where he was handed a nine-week ban for making contact with the eye or eye area of Northampton’s Christian Day in an Aviva Premiership match against Northampton. Many people have questioned the length of ban so here below we run the full transcript so you can make up your own minds. 1. The Panel found the citing proved on the basis of the evidence considered and the Player’s own admission. The Player pleaded guilty to the offence of making contact with the eye/eye area of an opponent, contrary to Law 10(4)(m). The Panel determined that the Player should be suspended for a period of nine weeks from 4th April 2011 to 6th June 2011. 2. The Player and his representative had no objection to the composition of the Panel. The documentation and evidence available to the Panel was identified and all confirmed that they had been given sufficient opportunity to consider the same. Pursuant to pre-hearing directions, a series of still photographs of the incident had been shown to Christian Day of Northampton Saints. He was available to give oral evidence, if required, to supplement his written statement. 3. The Player pleaded guilty to the charge of making contact with the eye/eye area of an opponent, contrary to Law 10(4)(m), the incident occurring in the 5th minute of the second half of the above match. 4. The written report of the appointed Citing Officer, Matt Bayliss, was based upon a clip of the incident shown as part of ESPN’s after-match analysis. Sale are attacking, which ultimately results in a try. There is an off-the-ball incident which starts with the Player and Mr. Day grappling with each other on the floor. Holding onto each other they begin to get to their feet – they fall to ground again and as they are getting back to their feet a second time and facing each other, the Player is on his feet and Mr. Day on his knees. Day is holding the Player’s right hand with his own right hand in a handshake grip. With his left hand, the Player takes hold of Day’s scrum cap towards the back of the head and behind Day’s right ear. The Player then shakes his right hand loose from the grip of Day and moves his right hand into the eye area of Day, grasping him with crooked fingers and applying force in a pushing motion until his right hand slides over the back of Day’s head and then goes on to grab the back of Day’s head. Both players go to ground again. Sale No.2 (Briggs) then commits a separate act of foul play which is dealt with by the Match Officials. 5. The Citing Officer spoke to the Match Referee, who confirmed that the Match Officials had seen no incident involving the Player. Furthermore, there was no reaction from the players to the alleged incident described and no mention of it on or off the field from either Coaches or players. 6. The Panel then viewed the match coverage of the incident which initially was only available to us in slow motion – approximately one fifth of real time speed. We also considered a series of still photographs taken from the television coverage. Taken together, these fully corroborated the description of the incident contained within the Citing Officer’s report. We then asked Mr. McTiernan to produce for us, which he did with the agreement of the Player and his representatives, a real-time version of the incident. 7. We next considered two written statements from Christian Day. The first was made on 5th April 2011. 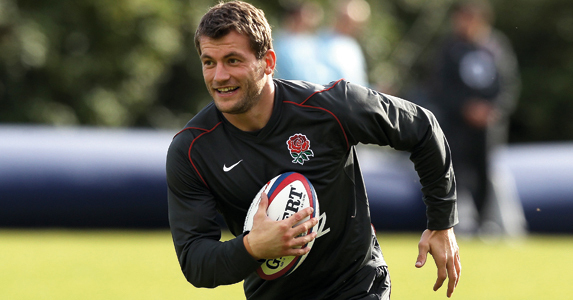 Mr. Day stated: “I made a tackle on Mark Cueto and ended up on my back. I felt a strike to the back of my head and reacted to this strike assuming this was Mark Cueto and we wrestled to the ground ….. As we were getting up, I felt a hand push me in the face. It was a pushing motion from an open hand and I felt no contact with my eye area. This incident then descended into a melee and the incident was over.” Mr. Day made a second statement on 7th April in response to the Panel’s direction that he comment specifically on the still photographs of the incident. He was asked to describe exactly what he thought the sequence of photographs showed. Having considered the photographs at length, he made the following further statement: “I understand that the photographic evidence appears damning, but that was not my recollection of the event. I can only describe what I felt at the time of a split second occurrence. Pressure was not sustained into the eye socket. Instead a “pushing” motion was experienced consistent with a shove to the face. If a finger inadvertently entered my eye then it was, in my opinion, accidental and was certainly not my lasting memory of the event. I have had the unfortunate experience of being “gouged” before, but this was not in any way similar”. 8. The Player accepted that he had put his right hand into the face of an opponent and this had led to contact being made in the area around the left eye. It was not however deliberate as he did not intend to place the hand where it ended up. He did however appreciate that there was a risk that his hand would end up at the eye area. Contact had proved minimal and there had been no injury. 9. The Player is 31. He has been a full-time professional for 10 years. He has 50 International Caps and is a British Lion. He is a team leader within the England national playing squad. He plays dedicatedly hard, but without malicious aggression and would not try to injure an opponent. He hopes he has a reputation amongst fellow professionals – many of whom he knows personally – of playing hard but fair. That he does not have a reputation for foul play is massively important to him, and this incident is a huge embarrassment for him and his Club. 10. The Player enjoys good relations with Mr. Day. After the game they had shaken hands and reflected on the incident as a schoolboy tussle. Mr. Day had never suggested that there was anything untoward in any of the contact. The Player took us through the incident by reference to the television clip which was shown in slow motion. He described being tackled by Mr. Day short of the line and having offloaded and sought to get back to his feet to support again. He had been held down by Mr. Day and reacted. The two started grappling, pushing and pulling. The Player was aware of the adverse disciplinary consequences of throwing punches. Mr. Day is bigger and stronger than him. He wished to take hold of him in a way which would give him some degree of control over the larger man. 11. The result which the Player was seeking to achieve was to grab Mr. Day with both hands round the back of his head and to hold him tightly. He had been able to get a good grip of Mr. Day with his left hand on Mr. Day’s scrum cap behind his right ear. He managed to shake his right hand free of Mr. Day’s grasp and was intending to bring his right hand round the left hand side of Mr. Day’s head and to grab his scrum cap behind his left ear and pull him tight. He accepted that he had missed and made contact with Mr. Day’s face, though the contact was only for a split second, even in slow motion. His right hand is seen to fly off the left side of Day’s face, behind Day’s head and he then makes a further attempt to grasp, which this time is successful. 12. Under questioning, he accepted that he was looking down towards the top of Mr. Day’s head, that his right hand was free and that he had complete control of where he placed that hand. He also accepted that his hand was crooked, in the shape of a claw, and that he carried out a “grabbing/clasping action” with his right hand. He maintained that this was not done with the intention of putting any part of that hand into the eye, or even onto the face. He believed Mr. Day accepted that that was the case because there was no reaction from either Mr. Day or any of his teammates. It was not mentioned again by Mr. Day at any stage after the match. 13. Several hours after the game, he was informed of adverse post-match analysis relating to the incident, but had not been unduly concerned because it had been no more than a scuffle and had not subsequently been mentioned. He did however look at the footage when he got home and was concerned that it looked very different to how it had actually felt. The incident was shown only in slow motion and so contact appeared to have been for longer than the fraction of a second it had been in reality. On 4th April 2011, he attended a disciplinary meeting at which he received an official verbal warning and an internal suspension of six weeks. As Club Captain of Sale Sharks, who were still in a relegation battle, he had been required to explain to the squad that he would be taking no further part in the rest of the season. He had been left in no doubt as to the consequences for his employer of having a world class player unavailable for the rest of the season. 14. We were asked to consider, and did so, detailed written references, testimonials and letters of support from Martin Johnson, England Team Manager; Rob Andrew, Rugby Operations Director; Brian Kennedy, Sale Sharks; and Altrincham Kersal RFC. We also considered the Minutes of the disciplinary meeting of 4th April 2011. (i) The witness evidence of Mr. Day, who confirmed there was no injury, harm, discontent or reaction on his part. (ii) The absence of any adverse reaction – deliberate contact with the eye area or attempt to cause eye injury or discomfort is generally abhorred by players and almost always results in some adverse reaction. (iii) The speed of the incident. Prior to the hearing, the incident had not been seen in real time. We did not believe the Citing Officer had seen it in anything other than slow motion and we concede that in slow motion (one-fifth speed) and in the still photographs, the incident looks, to use the words of Mr. Day, “damning”. It is not difficult to conclude from the position of the hand on Mr. Day’s eye area that significant pressure is applied by the thumb to the headguard, the little finger to the left cheek and the eye area by the three middle fingers which are crooked. It is a beguiling image which, taken in isolation, may tempt a Panel to conclude that what it depicts could only have been contact made deliberately. However, when the incident is seen in real time, the contact is so fleeting (less than one tenth of a second) as to be barely discernible to the naked eye and is in fact rather more consistent with, and supportive of, the Player’s description of the mechanics of contact and his intention. Having made the initial but fleeting contact, his right hand is seen to move behind Mr. Day’s head and as the two go to ground, the Player has achieved what he says he set out to do, i.e. made contact with both hands to the back of Mr. Day’s head and to continue to hold him in that manner. (iv)Mr. Day’s description of the contact. He has experience of deliberate contact with his eyes. He did not characterise this contact in that category. (b) The offending was reckless, that is the Player knew (as he admitted candidly when questioned) that there was a risk of committing an act of foul play. The Player accepted the risk. His right hand started some 12 inches in front of Mr. Day’s left eye area and at the same height. To achieve his objective, he had to move his right hand to the left of that eye area, over Mr. Day’s left ear and round to the back of his head. He intended to grasp and did so firmly in a situation where he was off balance due to the fluid nature of the pushing and pulling between himself and Mr. Day. Mr. Day did not duck or move. The Player’s actions were inherently dangerous and carried a significantly high risk of serious injury. (c) In considering the nature of the Player’s actions in relation to the offence, we reminded ourselves of the statement of principle established in the Hartley case in April 2007 (Panel: HHJ Jeff Blackett, Jeff Probyn and Jeremy Summers): “Contact with an opponent’s eye or eye area is a serious offence because of the vulnerability of an eye and the risk of permanent injury. It is often the result of an insidious act and is one of the offences most abhorred by rugby players. Serious offences of this sort – and particularly those known colloquially as “eye gouging” must be dealt with severely to protect players, to deter others from such activity and to remove offenders from the game to ensure that they learn the appropriate lesson. Clearly, “contact” encompasses a wide range of activity from applying pressure with an open hand to a finger intentionally inserted into the eye socket intending to cause injury. Offences which would properly be classified as at the Lower End of the scale of seriousness would include, but not be limited to, wiping with an open palm or fist without any real force or intent and causing no injury. In certain circumstances it might also include reckless contact with a finger into the eye area. Offences which would properly be classified as at the Top End of the scale of seriousness would include, but not be limited to, an intentional act designed to cause serious discomfort or injury to the eye or area around the eye of an opponent. The most serious offences in this category would be where permanent damage is caused.” That statement of principle encompasses a wide range of offending, between Lower End and Top End. In this case, there was no injury, but the Player grasped the eye area with some force. Whilst he intended contact elsewhere, it was entirely foreseeable in all the circumstances that contact would be made with the eye area. However, a distinction must be drawn between this case and the facts of Hartley who was found guilty of two offences of contact with the eye or eye area in the same match; in that case one of the incidents involved deliberate insertion of fingers into an opponent’s eyes, although only causing superficial injury. There was no provocation and the Player did not act in retaliation. It was a response to a “wrestle” between two players as part of a fast moving incident. (d) According to the evidence of Mr. Day, there was no effect at all upon him. He was unmarked and not in discomfort. There was no injury at all and he continued to play. (e) We considered carefully the effect of the Player’s actions on the game and found that the altercation had already started before the individual instance of the foul play charged. It continued as a result of grappling between the players but was not a direct cause of that grappling. The incident actually dealt with by the Match Officials involved Sale Sharks No.2 (Briggs) running into a Northampton player, for which Briggs (we believe) was dismissed from the field of play. (f) Mr. Day was not vulnerable and helpless, but part of the on-going altercation. (g) There was no premeditation. The incident was part of a learned response – just particularly badly executed. (h) We found nothing which would assist us under 19.8.2.5(h) or (i). 16. On of Mr. Smith that this is a low entry point offence. The Player targeted the head and grabbed at the eye area with his right hand in a claw-like grip. To get to the back of the head, he had to go past the eye area at eye level. This involved an inherently high risk of serious injury and he was fortunate that no such injury was caused. In our view, and unanimously so, the entry point should be correctly characterised as MID RANGE, giving an entry point of eighteen weeks. 17. We considered the aggravating features under DR 19.8.2.7. Having found that the offending was reckless with minimal and fleeting contact and no injury, we did not find it appropriate to impose an additional period of suspension as a deterrent and warning to others. 18. We considered the substantial and compelling mitigating factors in this case, and particularly the written references. The Player is clearly extremely well thought of at every level, from his continuing links with the amateur club where he started, through Sale Sharks and into the England playing and coaching squad. He is described as a model professional player who has always conducted himself in an exemplary fashion. He is highly rated by Club supporters and celebrates his testimonial next season. He uses his profile and fame within the game for the benefit of others, including Christie Hospital and in support of those communities hit by the Cumbrian floods in November 2009. 19. The Player has clearly understood the seriousness of the matter and its potential implications for his participation in the World Cup in New Zealand later in the year. He has faced up to what he has done and not sought to argue that it was purely accidental and to exculpate himself from any blame. He has accepted the Club’s internal disciplinary sanction and is clearly genuinely embarrassed and remorseful. 20. In those circumstances, we see no reason why the sanction should not attract the maximum mitigation and accordingly reduce the period of suspension by nine weeks. 21. Accordingly, in our judgment, the Player should be suspended for a period of nine weeks, from 4th April 2011 (the date of his Club imposed sanction) to 6th June 2011 inclusive. He may play again on 7th June 2011. 22. The Player/his Club will pay the costs of £500.00 as per RFU Regulation 19, Appendix 3. 23. There is a right of appeal against this Decision. Any such appeal must be lodged with the RFU Disciplinary Manager by 12.00 noon on Monday, 18th April 2011. We would wish to commend Sale Sharks RFC on their prompt and proportionate action upon being notified of this citing. Given that they are not certain of avoiding relegation, having a world class player unavailable for the rest of the season is a situation they can ill afford. It gives us no satisfaction to see a player of Mr. Cueto’s status in the game before us facing a significant sanction and express again our concerns in view of a number of recently reported cases involving serious eye injuries that players do not seem to realise the dangers of making any form of contact with the head and eye areas of opponents. Players would be well advised to avoid the head area altogether both in view of the risk of serious injury and the significant sanctions such offending contact attracts.